Women's Ariat® 12" Heritage Western R-Toe Cowboy Boots. For your inner cowgirl. 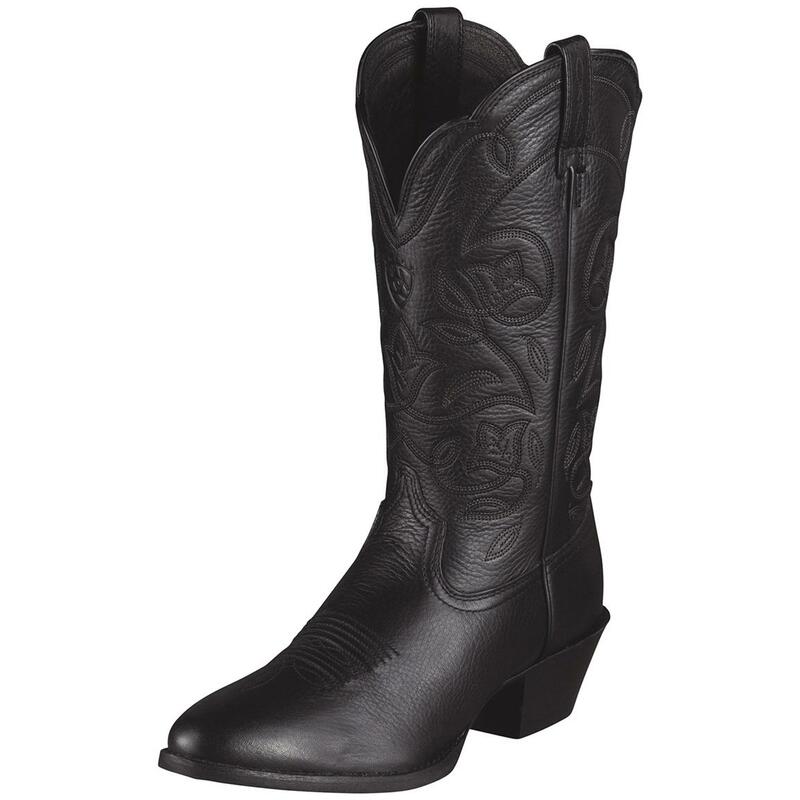 Comfortably distressed Ariat® Women's Cowboy Boots. Even if you don't live "out West," you'll move as if dusty trails and fiery sunsets are part of your world. This pair features a traditional R-toe... tapered, but rounded at the tip... for that realistic western boot flair. Elegant stitch pattern, dress rubber sole, and the cushioning ATSTM insole add to the "scenery." The ATS technology cradles, stabilizes and cushions the foot... and it's proven to reduce stress and shock to your feet, lower legs and back with a foot-conforming gel-cushion insole and composite fiber forked shank, for 3 times the stability of a typical steel shank. From Ariat, America's number one western performance boot brand. Each approx. 12" h., 27 ozs. 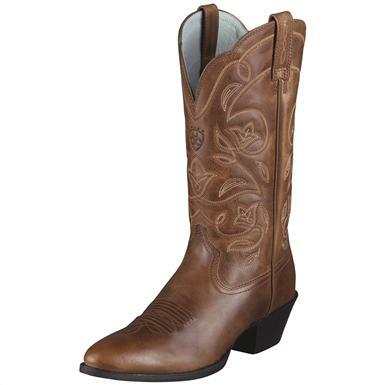 Womens Ariat 12 Heritage Western R-Toe Cowboy Boots is rated 4.7 out of 5 by 79. Rated 3 out of 5 by lindam from Great boot except for color. They are very comfortable, but are not really black, rather a weird shade of blue. "Distressing" looks a bit like mildew. Rated 1 out of 5 by Lilz from What the heck Ariat. I wish I could put no stars. I’ve always loved my Ariat paddock boots so when I switched disciplines I figured I would get some ariats again. These are the most uncomfortable pair of foot wear I’ve ever bought. No they were not to big or to small I bought them in person. I thought they would break in then I started doing some research about artists western boots and I bought a pair of Justins boots and they have held up and they were comfortable they first time I put them on. That’s the only brand I’ll wear now. Rated 5 out of 5 by Rae Chull from I Love Them I got these earlier this week and couldn't wait for casual day to wear them to work. They are comfortable straight out of the box. I've had them on for 9 hours now and they're still comfortable. I ordered a 7.5 c due to bunions and they fit maybe a tad large. They aren't tight at all. I am a size 14/16 so my greatest concern was if they'd fit my calves. They fit perfectly. They look really nice with my nice jeans for the office and a nice top. Rated 5 out of 5 by Lilly20 from Love them Bought them to actually ride western in and love them. I frequently clean them up with some leather cleaner and take them out on the town. Most expensive shoes I own besides my muck boots and worth every penny. Rated 5 out of 5 by Livin in my boots from great quality and fit Chose this boot for looks and comfort. I have never worn a boot with so much support and comfort. I needed a wide and I am thrilled with the fit and quality. Right away I was looking for a reason to get more colors! This one will take me everywhere! Rated 5 out of 5 by ddoty from Great Boots! I've worn these just once since receiving them, but they were comfortable for an entire evening at a concert with a fair amount of walking. No need to break them in before wearing. They are so cute and so comfortable! Rated 5 out of 5 by Vaile from In love These boots are very true to size and extremely comfortable. I love the style and color! Stomp out wet, cold weather.